In addition, welcome addresses by Gabriele Luczak-Schwarz (First Mayor of the City of Karlsruhe) and KIT Vice President for Research Prof. Dr. Oliver Kraft. An accompanying exhibition took place in the upper foyer of the town hall from January 21-25, 2019. Besides many posters, we exhibited models of the IceCube experiment, the KATRIN experiment, the CMS experiment, the Pierre Auger observatory and the FLUTE experiment. KCETA celebrated its 10th anniversary on October 26, 2018 at the Otto-Lehmann lecture hall. Among numerous interesting talks Julius Wess awardee Prof. Francis Halzen gave the keynote talk. Please find more details about the program here. October 3, 2018 – "Fast as light – on the trail of racing particles"
The WDR-mouse opens doors: On the mouse fan door opener day, children can take a look behind doors that conceal something interesting but are normally closed. This year with the participation of the KCETA Institute for Beam Physics and Technology (IBPT). IBPT staff introduced the young researchers to the secrets of modern technologies. Under the motto "As fast as light - on the trail of racing particles", the mouse fans carried out small experiments and found out what telephone, microwave and vacuum cleaner have to do with particle accelerators. Accompanying parents could use the time to learn more about KIT and its work for science and society. "It was an exhausting but also very successful day for everyone involved," said Professor Anke-Susanne Müller, Director of the IBPT and co-organiser of the KIT contributions. She reported on enthusiastic feedback from parents: "In a few years my daughter will be back here - for studying! Dr. Marcel Stanitzki (Deutsches Elektronen-Synchrotron (DESY) and Spokesperson of the SID Collaboration) addressed this forward-thinking topic in a very interesting public lecture. Date: October 1, 2018 at 7:30 p.m. This was the title of a public talk given in the frame of the workshop "Invisibles18" (see below) at the Karlsruhe Institute of Technology. In the Tulla lecture hall, which was filled to capacity, Prof. Susanne Mertens of the TUM fascinated the Karlsruhe public with her insights into the largest and smallest structures of the cosmos and into the large-scale experiment KATRIN located at Campus North. The Invisibles18 Workshop took place at KIT from September 3 - 7, 2018. The associated Invisibles18 School took place the week before, from August 27 to August 31, 2018, at the TUM Science & Study Center Raitenhaslach in Burghausen, Germany and was organized by the Max Planck Institute for Physics and TU Munich. Invisibles in astrophysics and cosmology: dark matter, black holes, gravitational waves. The Invisibles18 Workshop was organised in the context of the Horizon 2020 funded projects ELUSIVES (674896-ELUSIVES-H2020-MSCA-ITN-2015) and InvisiblesPlus (690575-InvisiblesPlus-H2020-MSCA-RISE-2015), which focus on Neutrino and Dark Matter phenomenology and their connection, with emphasis on the role of the symmetry relating matter and antimatter. It was the seventh thematic workshop in the series initiated in connection with the past ITN project INVISIBLES. More information on our indico website. On June 11, 2018 the official Inauguration of the Karlsruhe Tritium Neutrino Experiment KATRIN took place at KIT Campus North. The event marked the start of the long-term data taking to measure the absolute mass scale of neutrinos with unprecedented sensitivity. After numerous short greetings, which looked at the experiment from very different angles, there was an entertaining stage show by Stella and Nova presenting spectacular physical experiments, until finally the ceremonial opening of the data acquisition took place at the push of 15 buttons. In the afternoon, the event continued with a symposium with lectures by Nobel Prize winners Takaaki Kajita and Arthur B. McDonald as well as Hamish Robertson, Christian Weinheimer and Guido Drexlin. The lectures highlighted the important role of neutrinos in particle physics and cosmology and showed memorable milestones of KATRIN. 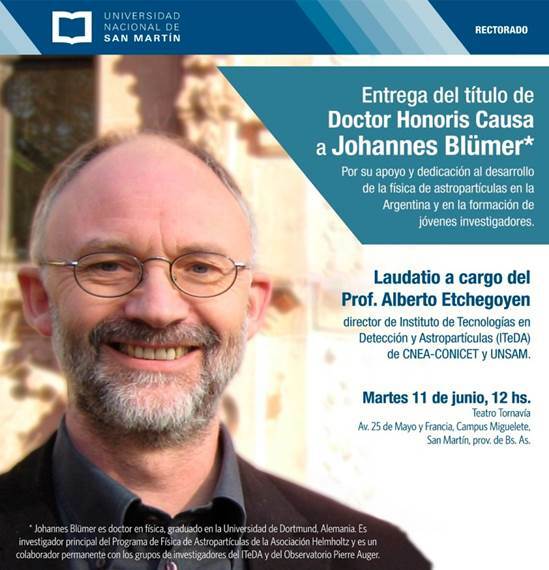 With this symposium HEiKA once again addressed scientists, students and the public. The symposium was an open meeting for everybody. Top-class speakers illuminated the topic DARK MATTER from different perspectives. The important bi-yearly conference Neutrino 2018 was held in Heidelberg. It was organized in common by KIT and the Max-Planck-Institut für Kernphysik (MPIK) Heidelberg. Several PIs of KCETA/KATRIN were involved in the Local Conference Committee of this intriguing event which also included an excursion day to KATRIN at KIT. "Did you already dream about the stars as a child and wanted to become an astronaut? Were you seriously disappointed with your astronomy and physics lessons at school and did you choose another profession? Only to read (astro) physics books after work and watch "Star Trek" or "The Orville" or "Big Bang Theory". Do you recognize each other? Then we have the right thing for you this summer: "Astrophysics in series". Four programs dealing with the universe - from theory to practical star observation." With this teaser, Campusradio Karlsruhe launched a series of live-programmes on the big questions of the universe on May 16, 2018. The guest of the first show was KCETA-PI Prof. Thomas Schwetz-Mangold. The programmes will be broadcast live on VHF 104.8 at 10 a.m. and simultaneously via the webstream of Campusradio Karlsruhe. There are repeats at 3 pm (only webstream of Campusradio Karlsruhe) and several times a week. On the third Nacht der Wissenschaft at KIT from November 24 to 25, 2017 between 8 p.m. and 4 a.m., many exciting lectures from more than 10 departments were on the program for interested citizens of Karlsruhe. The nature of dark matter in our universe is one of the greatest unsolved mysteries in cosmology and particle physics. Within the framework of the "Dark Matter Day", which is being held worldwide, two KIT researchers, both of whom are actively working in this exciting field, summarized our current knowledge of this mysterious form of matter and presented new experiments with which the secret of dark matter is to be uncovered. The interest of the Karlsruhe public was so great that the NTI auditorium on Campus South was filled to the last seat and no more standing room was available. After a welcome address by Prof. Marc Weber, Prof. Thomas Schwetz-Mangold spoke on the topic "Dark Matter - from Big Bang, Galaxies and Elementary Particles" and then Prof. Guido Drexlin on "Dark Matter - Experiments in the Mine, in the Laboratory and in Space". In September 2017 the second collaborative research workshop of KCETA and the Institute of Nuclear and Particle Physics (INPAC) at Shanghai Jiao Tong University (SJTU) took place. The main task was to explore the competence and expertise in China in the research fields of KCETA and to establish personal contacts for later cooperation. The workshop was supported by the successful DAAD proposal of the KIT service unit "Internationales (INTL)" for the reinforcement of the cooperative partnership with four selected universities from the province of Jiangsu and also in the area of Shanghai (SJTU, NUST, SUDA, TUS). On July 13, 2017 took place the inauguration of the FLUTE facility at Institute for Beam Physics and Technology (IBPT), Campus North. The focus was on the innovative, artistic presentation of the FLUTE. The event was opened with the official greeting by President of the KIT Prof Holger Hanselka. KIT Vice President Research Prof Oliver Kraft warmly welcomed the inauguration guests in the official start of the Test Facility. 17. Januar 2017 – "Lise Meitner und 'ihre Töchter' – Physikerinnen stellen sich vor"
With this exhibition Lise Meitner, one of the most important female physicists of her time, was honoured. It is a shining example of how women break new ground and make breakthroughs in science. Together with Lise Meitner, other female physicists were portrayed. In personal reports, they explained their scientific career, their fields of research and their wishes. The central aim of the exhibition was to encourage young people, especially young women, to devote themselves to physics and to inspire them for the MINT subjects (mathematics, computer science, natural sciences and technology). Physics is an important part of our culture and also offers excellent career prospects. There are currently around 5,000 vacancies for physicists in Germany alone. This number corresponds to two complete graduate classes in physics. The exhibition was initiated by the DPG and the Austrian Physical Society and funded by the Federal Ministry of Education and Research (BMBF). It is part of the "National Pact for Women in MINT Professions" launched in Germany by the BMBF. The exhibition opened on January 27, 2017 with a vernissage and could be visited until March 5, 2017 at the KIT Campus South in the foyer CFN. November 30, 2016 – Prof. Dr. Manfred Popp: "Weil nicht sein darf, was nicht sein kann ..."
Corrections to the history of science about "Hitler's nuclear bomb"
Prof. Dr. Manfred Popp will give a lecture on November 30th at 4 p.m. in the IKP auditorium on the topic "Because it is not allowed to be what cannot be... corrections to the history of science about "Hitler's nuclear bomb". "When I wanted to start the planned history of the (Core) Research Centre Karlsruhe with a prologue on the'predecessor organisation', the'Uranium Association' during the Second World War, growing doubts arose from reading the specialist literature as to whether it really could have been as it has been in the history books for over 25 years: The construction of a German nuclear bomb in the'Third Reich' had not taken place for economic reasons alone, the German physicists had known enough to be able to build it. After careful study of the original documents, I have come to the conclusion that this is not true. An article by me was published in the journal'Berichte zur Wissenschaftsgeschichte': (Link). A short version can be found in'Spektrum der Wissenschaft digital', another article will be the title story of the December issue of'Spektrum der Wissenschaft'. I will present these results on 30 November and put them up for discussion." Nov 10 + 11, 2016 – Symposium "Precision versus Energy, Present and Future Colliders"
On November 10 and 11 the Institute for Theoretical Nuclear Physics will organize a Symposium on "Precision versus Energy, Present and Future Colliders" to honor Prof. Johann Kuehn's 70th birthday. Cosmic revelation is presented in the context of the light art festival "Aufstiege" from 17 September until 09 October 2016 at the SV SparkassenVersicherung headquarter in Stuttgart. The four stairwells that form the four corners of the SV SparkassenVersicherung headquarters in Stuttgart are lit up in red. Now and then there is a flash of white light. On the roof a bright narrow light beam reaches up to the sky, pointing out that this illumination comes from the earth's atmosphere. Sixteen highly sensitive detectors designed by scientists of KCETA are measuring cosmic radiation in real time. When it penetrates the earth's atmosphere it leaves behind a cascade of invisible particles, which become visible as flashes of light in the stairwells. The project is both an experiment and a piece of light art. It has arisen from a collaboration between Tim Otto Roth, an artist from the Black Forest region, and astroparticle-physicists at KCETA. The four illuminated stairwells and the skybeamer at the SparkassenVersicherung building in Stuttgart. "Physics and Astrophysics of Cosmic Rays in Space"
ISAPP is a network of 36 European doctorate schools and institutes from nine European Union countries plus Russia and Israel. ISAPP’s main goal is to create a real astroparticle community amalgamating the elementary particle and astrophysics communities. Every year, the ISAPP European network organizes schools in astroparticle physics at the doctoral level for experimentalists, observers and theorists. The present year the school is devoted to the discussion of Cosmic Ray physics in the energy range from a fraction of GeV to more than one TeV. More information on the ISAPP website. 2 May 2016 - "On the trail of ghost particles - neutrinos on the pan of KATRIN". Since they entered the world of particle physics in 1930 with a hypothesis by the theoretical physicist Wolfgang Pauli, neutrinos have been regarded as mass-free and hardly detectable "ghost particles". It is indeed notoriously difficult to capture them in detectors - but since the findings of the neutrino oscillation experiments that won the Nobel Prize in physics in 2015, we know that neutrinos must have a mass. However, this is tiny compared to the masses of other particles, which puzzles the scientists. With the KATRIN experiment, the world's most accurate particle scale is currently being developed at the Karlsruhe Institute of Technology, with which an international team of researchers finally wants to track down the mass of neutrinos. Among other things, the scientists use a 24 m long and 10 m diameter stainless steel tank under high voltage, in which ultra-high vacuum also prevails. This is only one of many technical challenges that physicists have to face in order to solve the mystery of the neutrino masses. On May 2, Kathrin Valerius, head of the Helmholtz-University Young Investigators Group KATRIN, presented exciting things about the huge particle scale to a broad audience with curiosity and interest in physics at the University of Stuttgart. The workshop is organized jointly by Dr. Loredana Gastaldo (U Heidelberg, Kirchhoff Institute for Physics) and Dr. Kathrin Valerius (KIT, Institute for Experimental Particle Physics). The program is aimed at bringing together researchers from different areas of direct neutrino mass searches to discuss recent developments of experimental efforts in this highly active and fast-evolving field. A main focus is on facilitating in-depth exchange of experience among experimentalists from different backgrounds (notably, the tritium _-decay and 163Ho electron capture communities) through individual contributions, free discussion, and in small working groups. Furthermore, we intend to foster exchange with leading theoreticians in the field, in particular in view of further exploiting the excellent physics potential of upcoming precision experiments. A brief description of the workshop scope and objectives can be found here. Iris Gebauer, KIT, on the topic "Four Years AMS-02 on the International Space Station"
January 29, 2016 – "Nacht der Wissenschaft"
The "Night of Science" at KIT took place for the first time on the night of January 29 to 30, 2016. In exciting lectures, lecturers from various KIT departments gave insights into their subject area. Between the lectures, visitors and lecturers were able to exchange new insights over meals and hot/cold drinks. Where is the origin of all matter? To answer this question, he undertook a journey into the world of the smallest particles. The neutrino is one of the most common particles in the universe and it penetrates normal matter practically without interaction. The discovery of neutrino oscillatins, which won the 2015 Nobel Prize in Physics, proves that neutrinos have a (albeit tiny) mass. This has fundamental effects in cosmology and elementary particle physics and brings about a decisive equilibrium. Why all this plays a decisive role for our existence (and for Schrödinger's cat) was explained in this lecture. On November 4–6, 2015 the first collaborative research workshop of KCETA and the Institute of Nuclear and Particle Physics (INPAC) at Shanghai Jiao Tong University (SJTU) took place. The main Task was to explore the competence and expertise in China in the research fields of KCETA and to establish personal contacts for later cooperation. The workshop was supported by the successful DAAD proposal of the KIT servcie unit "Internationales (INTL)" for the reinforcement of the cooperative partnership with four selected universities from the province of Jiangsu and also in the area of Shanghai (SJTU, NUST, SUDA, TUS). The initial impulse was the strategy of the KIT presidium to strengthen the cooperation with China on a wide base. Eleven PhD students of the Karlsruhe School of Elementary Particle and Astroparticle Physics (KSETA) together with nine more scientists of KCETA came to Shanghai in order to present their research and to exchange with their chinese collegues. After Prof. Xiangang He (INPAC) and Dr. Irmgard Langbein (KCETA) had given a general overview, the first day focused on astroparticle physics with talks on dark matter, cosmic rays, and neutrino physics. The next morning was marked by talks about elementary particle physics, outlining theoretical as well as experimental aspects. Detector technology, electronics and the big infrastructures were introduced in further talks in the afternoon. There were also contributions of participants of Institute for High Energy Physics (IHEP) in Peking. On both days the participants had the chance to discuss intensly with the PhD students their reseach project. On Thursday night the workshop was complemented with a two hour colloquium with Prof. Mühlleitner and Prof. Müller on theoretical and experimental aspects of the discovery of the Higgs boson at the Large Hadron Collider, where teams of KCETA as well as of SJTU do research. Overall the workshop was on a very high scientific level and the participants were impressed about the amount of common features, which lead to significant possibilities for cooperation in various fields. German as well as Chinese PhD students expressed their interest in a research stay in the respective other country. The Pierre Auger Observatory is the world’s leading science project for the exploration of cosmic rays. More than 500 scientists from 16 countries have been working together since 1998 in the Province of Mendoza, Argentina, to elucidate the origin and properties of the most energetic particles in the Universe, coming to us from the far reaches of the cosmos. The AugerPrime upgrade to the Observatory enhances the 1660 existing surface detectors with new scintillation detectors, so that electromagnetic and muonic shower particles can be separated more efficiently. A symposium, held on November 15-16, 2015 gathered collaborators and science funding agency representatives for the signing of a new international agreement for continued operation of the Pierre Auger Observatory until 2025. Kids & Kosmos - what is a lunar eclipse? The EFFEKTE science festival has now come to a successful close. On the open day, interested visitors of all ages from Karlsruhe visited the KCETA information stand in the mathematics building. In addition to spectacular experiments with liquid nitrogen and the "destruction" of foam kisses in a vacuum cylinder, an octocopter developed by KIT was also on display. On the Teilch-O-Mat, everyone was able to find out in a personality test which of the elementary particles suits him best and have an appropriate button made. Of course, there was also information about KCETA's diverse participation in major international experiments on elementary particles and astroparticles. Kids & Kosmos was the name of our hands-on exhibition and it was a hit with children and young people between the ages of 6 and 19. Enthusiastic young researchers, young and old alike, were looking for answers to questions such as: What is our universe made of? What is Dark Matter? Where does cosmic radiation come from? Who lives in the particle zoo? Why is the Higgs particle so special? Solar system model, rallye, planet path, handicrafts, dark (liquorice) matter and much more did not let boredom arise! In the exhibition "Huge experiments for small particles", exhibits and posters of all large-scale experiments in which KCETA is involved were on display. A full-scale model of a Pierre Auger Observatory tank, a Tunka-Rex antenna, models from EDELWEISS, FLUTE and KATRIN and, the star of the exhibition, a model of the CMS detector, in which the proton beam and individual detector parts illuminated at the touch of a button. Among other exhibits, non-stop videos provided information about the various KCETA experiments. If you had any questions, you could contact competent exhibition supervisors at any time. We reported here about the exhibition "Art of Science - Beauty in Creation". Despite the heat, there were many interested people who took part in two tours of the KATRIN large-scale experiment at Campus North to learn more about the huge scale for the lightest particle, the neutrino. A journalist from "Die Welt" was also present and reported. The "Wissenschaft Live" event was a very special one. Everyone could be present in a lecture hall when we went live to the control rooms of major international experiments. Scientists from the CMS experiment (CERN, Geneva), the EDELWEISS experiment (in a highway tunnel near Modane, 1600m below a mountain), the Pierre Auger Observatory (Malargüe, Argentina) and finally the KATRIN experiment at KIT, Campus North, explained how to "control" your large-scale experiment. We were able to see the scientists and their colleagues live at work. Finally, there were many questions from the audience, which were answered by the scientists on site. "Tracking down the great mysteries of astroparticle physics"
"Higgs - or how particles get to their mass"
"The Image of the Universe comes from Karlsruhe"
On Friday, 26.6.2015 the exhibition "Art of Science - Beauty in Creation" was opened with a vernissage. After greetings by Prof. Johannes Blümer, Mayor Wolfram Jäger and Prof. Thomas Müller, Dr. Michael Hoch gave an introduction to the exhibition and the art project "art@CMS", of which he is the initiator. Michael Hoch, physicist at CERN and photo artist, wants to initiate a sustainable dialogue between scientists in particle physics, the art world and educational initiatives. In his own works, Michael Hoch portrays the CMS detector from an artistic perspective with the help of alienated photographs and collages. Besides him, three other artists had travelled to the exhibition and presented their works to the visitors of the vernissage in short lectures: Lindsay Olsen (USA), who uses materials to artistically process the standard model of particle physics; the photographer Bree Corn (Austria), who portrays scientists and captures their scientific statements and dynamics in photographic art; and finally Chris Henschke (Australia), who combines art and science with the help of experimental combinations of digital media. The exhibition was on display in the foyer of the CFN building (30.25) on Campus South until July 11. In the series "KIT im Rathaus", the Lord Mayor of Karlsruhe and the President of KIT invited to an event on January 20, 2015 in the Bürgersaal in Karlsruhe City Hall on the topic "News from the World of the Smallest Particles". "Introduction to the KIT Center for Elementary Particles and Astroparticle Physics"
"Neutrinos on the pan of KATRIN"
"The discovery of the Higgs particle or how the particles get their mass"
"Art@CMS – a novel way to achieve a sustainable inspiration in public for science"
On November 12, 2014 scientist, photographer and artist Michael Hoch (CERN) gave a talk on "Art@CMS – a novel way to achieve a sustainable inspiration in public for science". Michael Hoch was born in Vienna, Austria, where he studied Sports and Physics at the University of Technology and the University of Vienna. During his studies and work as trainer he was concentrating his photographic art work on human movements and architecture. Later coming to Geneva to make his PhD at CERN he started to work on his long-term project, "Where Science Meets Art". Public lectures at the conference "Astroparticle Physics in Germany"
With two public evening lectures and an Astroparticle Slam, astroparticle physicists in Karlsruhe informed about the structure of the universe and current research. In only eight minutes, eight doctoral students of astroparticle physics presented their research: entertaining and understandable, curious and transverse. Read here which of the lectures the audience selected as the overall winner. Over the last decade, astronomy has opened a new window into space: extremely high-energy gamma rays. Gamma rays allow astrophysicists to search for exotic dark matter in the cosmos or to scan the structure of space and time on the smallest scales. The energy of such gamma quanta is 1000 billion times higher than that of visible light; they can no longer be generated by thermal processes - the radiation of hot bodies - but show us another aspect of the universe: the "non-thermal universe". Special instruments, such as the H.E.S.S. telescope system in Namibia, can be used to visualize the "traces" that gamma quanta leave behind when they hit the Earth's atmosphere. The surprising result of the work of the last decade is that a multitude of such extreme radiation sources exist in the cosmos and that these probably influenced the evolution of the cosmos. To understand the universe and decipher its complex blueprint, physicists use telescopes and detectors to observe the sky. The fantastic images of shining galaxies are well known. Light, electromagnetic radiation, is a familiar cosmic information source; others, such as neutrinos or cosmic radiation, are less so. We can only directly observe the processes inside stars and active galaxies with the help of neutrinos - even if some of the particle properties of neutrinos are still a mystery to us. Cosmic rays and high-energy neutrinos give us information about the most energetic processes in our universe. Only if we evaluate all these sources of information can we "read" the construction plan of our universe. With the goal of expanding the physics reach of its experiments, the Large Hadron Collider in its Phase 2 will be upgraded to reach an instantaneous luminosity that is an order of magnitude higher than what will be achieved in the upcoming runs from 2015 onwards. In order to exploit the full power of the accelerator and to survive the hostile high radiation environment as well as to meet the challenge of reconstructing the more than 100 interactions that will occur at each bunch crossing, the detectors at the LHC need to undergo an extensive upgrade programme. At this collaboration meeting in Karlsruhe, which was organised by long-term CMS member institute Institut für Experimentelle Kernphysik (IEKP), 264 experts from the CMS collaboration from 80 institutes all over the world congregated to exchange ideas and to plan the ambitious upgrade of the detector. Please find many more pictures here. The Julius Wess Award 2013 is dedicated to Prof. Takaaki Kajita, ICRR Tokyo, for his outstanding credits in the field of neutrino physics, particularly for the discovery of neutrino oscillations with the Super-Kamiokande detector. The ceremony will take place on December, 19 at KIT, Campus South. "AMS-02, a space experiment on the International Space Station in search of dark matter"
The Alpha Magnetic Spectrometer AMS-02 was flown with the space shuttle Endeavour from the space station Cape Canaveral (Florida) to the International Space Station ISS on May 16, 2011. Since then, it has been investigating the composition of cosmic cosmic cosmic radiation with unprecedented precision. In the foreground is the search for antimatter, as it is expected within the framework of cosmological models as a relic from the Big Bang. AMS-02 is also intended to answer questions about the nature of dark matter. Scientists from Aachen and Karlsruhe are in charge of the experiment in Germany. First results, published in summer 2013, will be presented. Helmholtz Alliance Workshop: "Physics at the Terascale"
Workshop "Physics at the Terascale"
On Dec. 2 - 4, 2013, the 7th Annual Helmholtz Alliance Workshop on "Physics at the Terascale" will be held at KIT, Campus North. The workshop with 250 participants aims at bringing together the whole Alliance community, reviewing the status and progress of the research topics and discussing future directions and projects. The organisation has been shared between the Institut für Experimentelle Kernphysik (IEKP) of KIT and DESY. The Alliance “Physics at the Terascale” or short “TERA” was created by the Herlmholtzgemeinschaft in 2008 in order to optimally place German particle physics in a global research environment and to bundle the German activities in the field of high-energy collider physics. It is a network comprising all German research institutes working on LHC experiments, a future linear collider or the related phenomenology - 18 universities, two Helmholtz Centres (DESY and KIT) and one Max Planck Institute. The Alliance includes the following topics: development of new accelerator and detector technologies, methods of data analysis, development of theoretical models and methods and development of the relevant computing infrastructure. An important aspect of the Alliance is the creation of common infrastructures. All partners of the Alliance contribute to and use these infrastructures for specific research projects. One of the structures is the Radiation Study Center at KIT, coordinated by the Institut für Experimentelle Kernphysik, to simulate and analyse conditions in hostile radiation environments expected by detection systems at the High Luminosity LHC. More information may be found in https://indico.desy.de/conferenceDisplay.py?confId=8029. Ultra-high energy cosmic rays are measured using the fluorescence technique by several air shower experiments. For a proper reconstruction of the extensive air shower, the yield of the air fluorescence and its dependence on particle energy and atmospheric parameters have to be known. To push this field forward and expand our knowledge about air fluorescence, this series of workshops was started in 2002. The main goal of this workshop is to continue the fruitful discussions of the past nine years between scientists performing air fluorescence studies and air shower analyses. The practical benefits of this meeting are the exchange about theoretical aspects as well as on experimental experiences. Driven by the common goal to reduce uncertainties in the energy calibration of cosmic ray experiments, the workshop is going to support achieving an improved understanding of air fluorescence. Developing an up-to-date fluorescence yield parametrisation that can be used as an experiment-independent standard parametrisation for better comparison of UHECR measurements will be a break through in astroparticle physics. The ISAPP Summer Institute (SI) will be held from July 20th to August 7th, 2009 at the Karlsruhe Institute of Technology (KIT). It is organised within the KIT Center Elementary Particle and Astroparticle Physics (KCETA). Most activities of the SI will take place at the Campus South and Campus North of KIT. The Summer Institute offers participation in current research projects within KCETA. It addresses PhD students in theoretical and experimental particle & astroparticle physics. The participants will gain insight into the ongoing research, get know-how on experimental techniques via specific SI projects which are embedded into the current work programme at KCETA. The programme of the SI consists of introductory seminars into the fields of particle and astroparticle physics as well as the specific research projects and experimental techniques. The SI is focussed on individual participation of the students in research projects such as Auger, CMS, EDELWEISS, KASCADE-Grande, KATRIN, LOPES, grid computing and data processing & electronics. To ensure a most efficient course, the number of participants in the SI is limited to 25. A network of European Doctorate Schools has organized a common curriculum in Astroparticle Physics. On the basis of agreements among these schools, specialized courses concerning Astroparticle Physics are organized in a common International School on Astroparticle Physics (ISAPP), while bilateral or multilateral student exchanges concerning the research activities in this field are also possible, in view of their thesis preparation.